When I was young, my favourite meal was a hot dog and a chocolate milkshake. The hot dog might become the subject of a future post, but I loved chocolate milkshakes. I could have one with every meal - sometimes two per meal. The perfect milkshake is a very difficult thing to make, and I've never attempted to make one, as I can no longer afford the calories. You'd think it'd be fairly straightforward - chocolate ice-cream and milk - but that's not all there is to it. It must be a good quality ice cream that is rich and fairly creamy, but cold or firm enough that it will not melt completely during the mixing process, as there's nothing worse than a milkshake that's just melted ice cream diluted with milk. The depth and intensity of the chocolate has to shine through, and far too often I've taken my first slurp of a milkshake only to be confronted with the rather commercial and generic taste of Magnolia chocolate ice cream. In terms of texture, the milkshake has to be thick, with the right blend of melted and unmelted ice cream to give it sufficient body, consistency and coldness. I'm not sure I would call this the best chocolate milkshake in Singapore, but it comes pretty close. It has the right sort of consistency (although I thought they'd over-mixed the ice cream), it's almost cloyingly rich, and it's perfect on a hot, muggy Sunday afternoon. For the weight-conscious, it even comes in two sizes (although, if you're looking for a real milkshake fix, the small, pictured here, probably will not satisfy). I'd first heard about Once Upon a Milkshake ("OUaM") from my cousin, who, knowing my fervour for milkshakes, recommended that I try the place out. Looking oddly out of place in the new Maxwell Chambers, a clean and simple purple and white theme, as well as decorations that range from chic to flighty, proclaim that OUaM is in no way affiliated with the serious arbitration sets located upstairs. OUaM doesn't just offer chocolate milkshakes; they also have other flavours such as strawberry and mocha that come with imaginative names (Pirate Queen Peach and Nutty Peanut Butler, for instance). Conveniently located a stone's throw from Tanjong Pagar station, OUaM provides a convenient teabreak spot for the many accountants, financiers and lawyers who work in the area. The next day, we had made a lunch appointment with an old friend and we decided to try our luck with Prune in the East Village, which has no reservations. Arriving at 1pm, we were shown into a faux-vintage French street corner bistro (complete with coppered mirrors and shabby tables and a shabby hairy old man in the corner seat, poking at his very raw steak tartar). Secretly, I wanted to find Prune poor because it would vindicate my prejudice against restaurants that won't let you make reservations and which have perky blonde pink-teed waitresses that look like they were mean in high school. 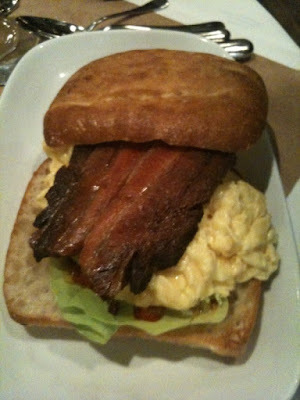 However, having been recommended it by a fellow blogger, as well as a chef-friend, I knew it probably would not be. What I was not prepared for though, is how clever the cooking was. M. and I shared a tasty French omelette of beef tongue and bone marrow and an Eggs Sardon, a wicked take on the Eggs Benedict, with a poached hollandaise egg on top of a steamed artichoke heart, served with a slightly tangy Thai chilli sauce. The beef tongue was braised till it was tender and falling apart with the juices and sweetness of onion and stewed accompaniments. It was fantastic and comforting, I could have eaten one everyday. 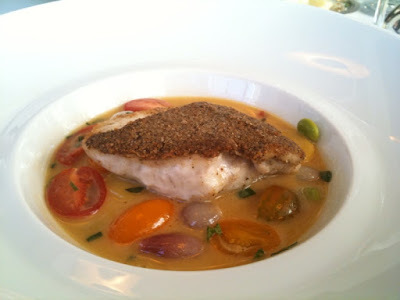 The sea bass that Z. had was also very good, well-crisped on the top and sitting in a comforting soup bed of salted vegetables. After lunch, I wheedled M. into a search for the best Tres Leches cake in New York. I had read an article on Chowhound which suggested that two of the best were to be found at Cafecito, Cafe Cubana and Ideya. Ideya I actually knew, I often passed its blue and white tiled interior on my way to work, many years ago but I had never stepped in. In any case, their Tres Leches was only voted on the strength of its unusual banana topping and I was after the original. I was really keen to go to Cafecito, which was all the way out in alphabet city- Avenue C.
It must have been because she had not seen me in a long while, for her residual guilt caused her to trudge semi-willingly, a great distance, to reach a shacky Mexican street. The cafe seemed closed but luckily, we were directed to the restaurant of the same name next door and two aluminium foiled plates were shoved at us. This cake was topped with cream and pineapples, a nice touch, but it was dense and crumby. It didn't have the lightness of the Cafe Lalo version, instead it was reminiscent of a rum baba, except with milk. On our way back to Chelsea (we had decided to walk because it was one of those bright glorious days where the smoke billowed white against the red brick and river blue sky, where the sun shone warm but the wind blew cold), we passed Ippudo and decided we should have ramen. Half an hour later, we walked passed a Singaporean-Malaysian restaurant Laut and decided we should spend $13 on a sub-standard Chicken Rice- they were still closed before dinner, so we had them deliver when we finally got back to the apartment. We were recommended the prawn noodles at this restaurant, which was better than the Chicken Rice but neither were really South East Asian standard. I'm not entirely sure what made us eat literally, every few blocks but I guess that's just what you do with friends you haven't seen in awhile. Convivio is one of Michael White's trio of Italian restaurants and has a Michelin star, it's the sort of restaurant dating couples would praise, with its slightly reverbatory atmosphere and dim lighting. The food, especially the pasta, is certainly excellent and it's one of those places my parents would like, if you know what I mean. I have a feeling one word that would describe it is "consistent". It's old, it's well-heeled, it's sensible but slightly lacking in personality. On Friday, I had a letterpress class in Brooklyn that lasted till the afternoon. Had I thought about it better, we could have gone to this Danish Vintage Furniture warehouse next to the studio and tried to get seats at Franny's or Purple Yam in Brooklyn. I had heard much about Franny's, its genesis, its founder’s commitment to local, sustainable agriculture and it's delicious, environmentally responsible cuisine. I had also heard about the crazy queues and their no-reservations policy, so even for a restaurant that had me at "franny's is a team of over 20 hardworking and loyal people who are committed to giving our guests the highest quality and most consistent food experience possible", it was a bit of a stretch. Purple Yam is a brilliant Pilipino restaurant, run by the folks formally at Cendrillon (till the high New York rents ate them and spat them out in Ditmas Park, Brooklyn), which I'd been meaning to try. However, I was too keyed up and full of letter pressing information to think straight, so we skipped lunch and ran some errands until dinner at Dovetail. 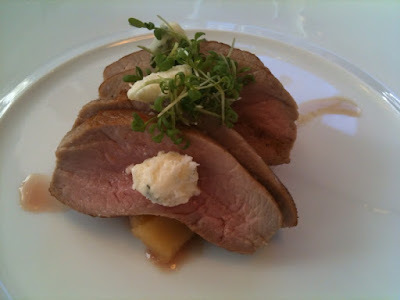 The dinner at Dovetail was with The Alpha Male, so I can't really say anything bad, can I? 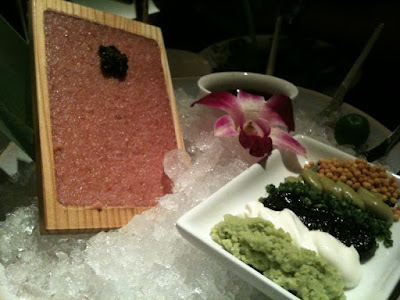 I was a little surprised because I thought from the pictures and review that Dovetail was a hole-in-the-wall and thus was giving him major props for having found a gem of a place in the swanky upper west of all areas! Five years after the day, I still remember his rather-seductive description of making your own sushi with ponzu sauce, so that boded very well but as it turned out the place was actually a fairly large, very corporate looking- non-descript decor restaurant with chandeliers, thick napkins folded in fans, condescendingly beautiful staff dressed in black who take your coat (and it was next door to the new, indoor Shake Shack). It filled up with immense speed over dinner and the food was really good, just really...well, safe. The restaurant was the 2009 NY Mag's critic's pick for 3-star restaurants and the chef, John Fraser, a veteran of some of the world's great kitchens, including Thomas Keller's The French Laundry. The disappointment was that the food was well executed, but more like a study in French cooking, than an exercise in creativity. I had a beet-related appetizer, a duck breast with a cherry reduction and pistachios and a cheese plate for dessert. The most exciting part of the meal was the conversation (not necessarily a bad thing) and skating at Bryant park in the chilly cold after dinner. 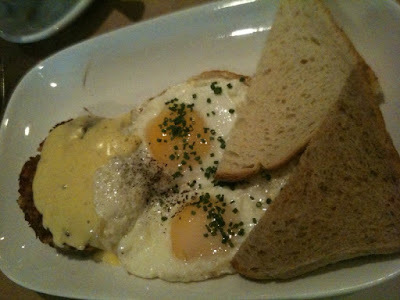 Sadly, our holiday was coming to an end, marked by a weekend stay with old friends and Saturday brunch at Craftbar. Craftbar is Craft's informal sister-restaurant, helmed by Chef Tom Colicchio. It was very crowded for brunch when we went and the food was not bad but not exactly innovative (then again, it was brunch, not dinner). The space and decor were modern-cool but again, rather crowded in a city with style to spare. 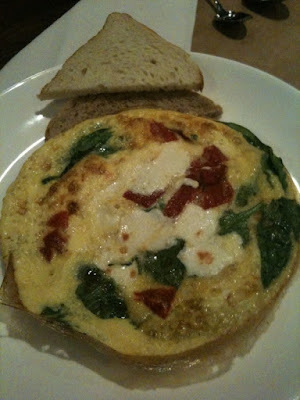 We had the staples, the breakfast sandwich, sunny-side-up eggs and hashes and then a few more interesting dishes like the French toast (mediocre) and the spinach egg white frittata. That night, we went out for a late dinner at Pearl Oyster Bar, an old haunt I had not revisited since college days near NYU. This place is quite a gem, it's a little hole in the wall oyster counter, serving up mussels with frites, shucked oysters and the most gigantic lobster roll you've had in awhile. It doesn't take reservations for dinner, is thus invariably crowded and the line forms out the door (a pretty good feat on a bitterly cold night like the one we were there on). We declined to wait for a table and got seats at the narrow marble wall-facing counter straight away. We brought our friends, one of whom isn't even a big seafood lover but the lobster roll, with its sweet mayonnaise meat and toasted glazed bun and mountain of shoe-string fries, convinced her. It is as good as I remembered it, although now that I have a better comparison, the clam chowder and oysters are better at Swan Oyster Depot in San Francisco but the lobster roll is better here. Till 2011! The next couple of days passed in a cold freeze and warm companionship. Our friends had returned from their trip and when I picked up her call, the first thing she said was, "Jean Georges has $29 prix fixe for lunch, and I heard its good, want to go"? Don't we all need friends like that? Thanks to her OpenTable.com reservation (a brilliant site, we need a more developed system in Singapore - I hear there's one being started called DiningCity.com), we secured a table for the very next day and duly arrived in the well-lit and high-ceilinged dining room, which boasts good views of the very newly-constructed area of town at the crossroads of the Time Warner building and Central Park West. I have to say the place was very polished - it was very three-star-looking, if you know what I mean. It had that combination of shine and minimalism, even in decor and as we were to find out, the service was discreet and the cooking was excellent. We managed to taste a fairly large assortment from their prix fixe lunch, we had the Foie Gras brulee and Pineapple-Meyer Jam, the Goat Cheese Royale, Roasted Beets and Toasted Pecans, the Sesame Crab toast, miso-mustard, Asian pear and Shiso and the Hamachi Sashimi, Sherry Vinegrette and Toasted Pecans. The restaurant follows the nouveau (read: atas) tradition of listing the ingredients and only where necessary, the cooking method. We ordered an extra appetizer of frog's legs (pictures above). Of the four choices, the Sesame Crab was the runaway winner for its full, savoury crispness (not an easy combination to create!) and the Foie Gras brulee for its smooth, rich custard. 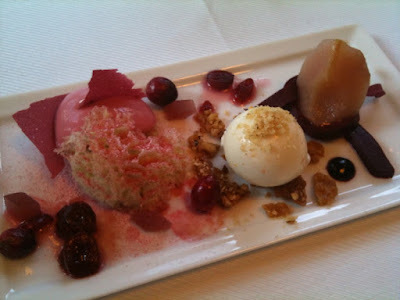 Although my choice, the Goat Cheese Beets, was neither the most unique nor the most power-packed, I really liked it and enjoyed its pretty pink spring-like hues and flavours. 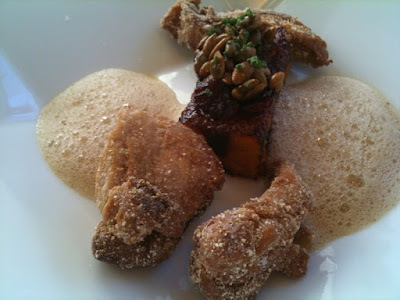 This dish probably explains why there were so many Asians in Jean-Georges, the mouth-feel of his food is very light, with a lot of clarifying ingredients and sensations. The plates also came decorated with pleasing colours and dibs and dabs of this and that candy, gel and taste, rather like but stopping short of the nameless goos that make up kaiseki. It was focused but creative, a bit like the big brother of Fifty-Three in Singapore. The mains were Roasted Veal with Quince-Pineapple Compote and Roquefort, Caramelized Sweetbreads with Candied Pumpkin, Liquorice and Sherry Vinegar Emulsion, Grilled Beef Tenderloin with Crunchy Potatoes and Pear Horseradish and the last was Slowly Cooked Cod with Black beans, Sake, Cilantro and Ginger. After the strong tastes of the appetizers, what struck me about the mains was that they were smooth. The roasted veal was wonderfully balanced and despite the interesting mix of ingredients, there wasn't a taste that was out of sync. We tried all four desserts on offer: Spiced Star Anise and Ginger sticky bun; Pecans and Thai Pepper Creme Caramel; Late Harvest-Spiced Poached Pear; Beet, Walnut and Sour Cream Ice Cream; Chocolate - Jean Georges' signature chocolate cake, Vanilla Bean ice cream, cocoa noodles, peppermint broth and chocolate sorbet - and Apple - Sparkling Apple, Fennel, Pomegranate and Pistachio Cake. The funny thing about the desserts is that they did not much represent their titles and they were a little deconstructed, for example, I worried about the peppermint in the chocolate dessert, as I don't like mint but it turned out to be a completely separate green broth in a bowl and it didn't seem to have much purpose - a dipping sauce? 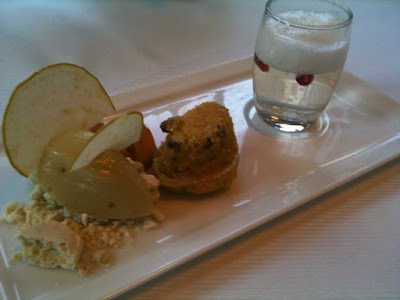 Similarly, the Sparkling Apple turned out to be a drink - like clear cider in a shot glass, which was cute but not really much of a counterpart to the otherwise very good Apple Pistachio Cake. At the end of the meal, there was the much-hyped dessert tray of hand-cut marshmallow snakes and some chocolate. Having such a meal at such a price though, is definitely one of the reasons to miss New York and you should definitely go if you are visiting. It is however, a meal from which a large guy may not feel completely full. We left the restaurant for a walk through Central Park and Whole Foods at Time Warner, where we bought some pork ribs, fresh greens and Chilean sea bass for laksa fish at dinner. After dinner, we made reservations for lunch at Morimoto the next day and took the cross-town bus to Cafe Lalo, a campy French, dark wooden yellow lit dessert cafe or else famously known as "the cafe where she waits with a rose in You've Got Mail". I've been returning to this cafe since my first college trip to New York, too many years ago to own to and I do love the atmosphere, the warmth and cuteness of this little place. The desserts are actually not that good anymore, although that could just be the sweetness of nostalgia talking, but they are still pretty decent- we had the crème brulee and the tres leches cake, which started my obsession with this Cuban-Mexican dessert (more on this in a later post). I must have slept soundly after all that fat and sugar- I arose near lunch and had to jog along to Morimoto, which was thankfully, just a couple avenues away. The first thing that stuck me was that Morimoto was a converted warehouse space, it's location on one of the very most western avenues means that it is actually fairly close to the water and docks, so the space has soaring ceilings and a wide floor, which they've made the most of with wow-some curving translucent installation walls (made entirely of empty plastic bottles) and a deep light parquet dining floor and a wide white standing sushi bar. The second thing that struck me was that lunch was very affordable- $24 for 3 courses and in fact, $18 for 3 courses if the main was gyu-don. Unfortunately, the service was rather curt, once they realize we weren't going to build up a huge sushi bill or order sparkling water and we quickly realized that the Morimoto signature omakase dishes were only available at dinner. 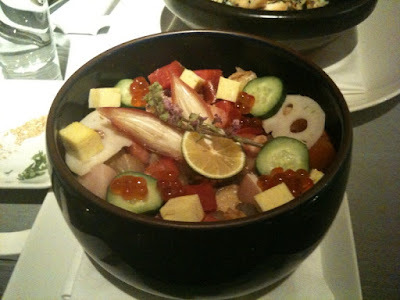 Still, the lunch sets were very adequate, we tried three- the buri bop, which turned out to be seared hamachi-don in a hot stone bowl, the unagi and foie gras bop and the chirashi. Of course, we had to try his signature toro tartar (the one featured on all his websites) and discovered that instead of a steak, it was a microscopically-shallow mandolin of crushed toro, which you scooped up with a flat jelly spoon and swiped across a plate of garnishes including crushed seaweed, wasabi, sesame, and puffed rice balls. It was tasty and surprising in taste but poor value and somehow seemed a little trite and showy. It reminded me of how, since Morimoto's reign on Iron Chef, the pendulum of food culture has really swung back from the snazzily-creative and molecular to the solid, neo-vintage comfort- think Julia Child, beef bourguignon and cupcakes. We followed Japanese upon Japanese with dinner at Sugiyama that night, with a simple chef omakase that included their uni tempura (available upon request), black grilled cod, monkfish liver and sashimi. We didn't try the kaiseki, which is also known to be good. Sugiyama used to be located in Soho and with their move to the Theatre District, I had heard that the food had seen better days. The decor is certainly a bit dated but the food was simple and tasty. I'm not sure I would go back but it's somewhere where you can get a good meal and a quiet table, in the warm embrace of Nao Sugiyama and his staff. One interesting place is the yakitori grill restaurant above Sugiyama, I didn't make note of the place, as we were just looking for a place to escape the cold but they served us fried crispy tofu and seared chicken skewers. The place smelled something amazing and their menu looked vast and sublime (and I don't even like fried Japanese food), especially, I'm sure, if you were having one of those beery boy nights. The next day was Wednesday, which I got to spend with my old friend Y, we shopped the day away quite effectively, egging each other on and spending far more than we probably should have (there's just nothing like shopping with friends, it is definitely one of precious perks of the working woman life. That night, Z. and I had a reservation that I was really looking forward to, as Eleven Madison Park had been my favourite restaurant when I worked in NYC a long time ago. Back then, the restaurant was a slightly clubby but very chic restaurant, it had high vaulted ceilings, befitting a building that used to house the Federal Reserve and candlelight- the kind of restaurant that would be filled with stylish people and low chatter and definitely a fancy date restaurant. Since then, the restaurant had changed hands and joined the Relais and Chateau group. It has also earned, recently, its fourth NYT times star and was it the third Michelin star? Which explained why we were eating at 9pm at night. I don't have pictures in part because the lighting didn't really allow for it and also because their website has stunning photos of the dishes. What I noticed is that the restaurant had also been remodelled, less gotham and more LA, with the addition of more light and white orchids in test tubes. We were also impressed with the service, which was discreet but friendly and prompt. We had barely sat down when the waiter came by with hot rolls and olive bread, with some lovely French butter. 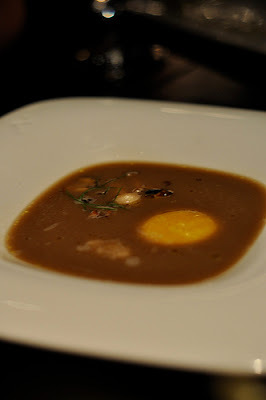 They also brought the amuse bouché swiftly, which was a piping hot and filling chestnut cauliflower soup. This greatly enamoured Z. to the place immediately. We decided to have the very reasonable $68 dinner prix fixe, I chose to have the Heirloom Beets Salad with Lynnhaven Farm Chèvre Frais, Rye Crumble and Nasturtium, which was, although beets had been a frequent ingredient in New York, the most beautifully presented and wonderful tasting of the lot. It was so fresh and clean-tasting, think I must have looked like I inhaled and poked up the whole plate. Z. had the Knoll Krest Farm Egg, Slow Cooked with Vin Jaune, Winter Mushrooms and Everglades Frogs’ Legs, which we both agreed, was the best dish of the meal, perhaps the best dish of New York. Smooth and rich, the egg was soft-boiled and coated the mushrooms, somehow producing an almost risotto-like texture, quite amazing. Z's main was Bouillabaisse-Dover Sole with Bouchot Mussels, Bay Scallops, Nova Scotia Lobster and Chorizo, it was very good and the chorizo is a good idea, it added an interesting spicy element. I chose the St. Canut Farm Cochon de Lait, Variations with Butternut Squash, Plums and Black Trumpet Mushrooms ($20 supplement) which was a bad choice. It wasn't bad exactly, the variations were quite interesting but crispy pork belly is crispy pork belly and pork roulade is quite chunky, it's like mouthfuls of pale meaty striated pork, so I was quite disappointed, it definitely did not melt in the mouth and wasn't worth the supplement. I should, I think, have stuck with my first choice of the beef. For dessert, we couldn't decide between the Tahitian Vanilla Soufflé, Vermont Quark and Passion Fruit Sauce and Gianduja, Amedei Chocolate, Espresso and Hazelnut Sorbet and the Caramel Apple-Toffee, Walnuts and Granny Smith Apple Ice Cream recommended by the waiter and he brought us a complimentary plate of the third dessert! The desserts were fairly classic and very well executed, I think if I were to do it over, I would have picked those with more esoteric ingredients, given my now high level of confidence in the chef! I would also, if I could, come back for their lunch set which includes a selection of tarte tart in and lemon meringue tart for dessert. Later in the night, the chef Daniel Humm came out to talk to diners and I was impressed by how young he was. After dessert, the waiter brought us a plate of colourful mini macarons. I am not the biggest fan of varied macarons, I tend to feel that some macarons invariably get compromised but this plate was good, the dark berry, pistachio and passion fruit tastes were all very natural. After the macarons, there was separate place for tea and a plate of canele, chocolate, then we barrelled out of the restaurant, feeling full and sated. I think this continues to be my favourite restaurant and the best dining experience of the trip. We arrived in New York, cold, hungry and huddling in our flapping coats as we tottered down the wind-whipped streets. It was wintry-cold and snowy on our first day there though we were fortunate and the sun came out for most of our time in the city. In truth, it was probably far less cold than I remembered Boston winters for example, to be. We were also very fortunate to have some warm and beautifully furnished places to stay, so that really helped our experience. Right off the bat, I will admit that I envy the New Yorkers, amongst Americans, for their choice of produce, the freshness of produce and the luxury of having the world's best restaurants and chefs at your doorstep. I could eat forever and only work my way through a fraction of what the city has to offer and yes, of course Whole Foods has its issues (it is mass fish and chicken after all, you would think people know better than to expect it to be pristine in process and origin) but still, it is incomparable to the overpriced and meagre selections that the rest of the world contends with. Incomparable! It is our own fault that we did not have a bigger breadth of eating experiences. 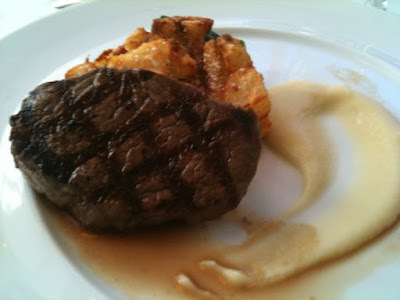 We ate enormously and famously but I didn't for example, make pre-bookings 2 weeks ahead of time. I didn't queue online while in LA for seats at Morimoto. And very often, we were simply too lethargic or cold to track across town for an eatery that didn't take any reservations. Still, we managed pretty well, on the morning that we arrived on the red-eye, we showered up and discovered happily that City Bakery, on West 18th between 5th and 6th Ave, was on the same street where we were staying. Z. said that if he lived there, he would go every weekend. Truth be told, City Bakery now looks like it's seen better days. It used to be a chick-magnet, a casual, two-story mezzanined eatery that offered gorgeous lemon tarts on a chocolate base, thick hot chocolate with cubes of home-made marshmellows and caramelized french toast on weekend brunch. Now, like the faded memories of old flames, the place is a little more derelict (perhaps because they've taken on catering as a main business), a little emptier (though still crowded on weekend noons) and the food selection is much less robust- I had the best tofu skin, smoked salmon and edamame salad here before, now their best offering is raddioco, chickpeas and rocket. Still, it's a great place to catch up with a friend and the caramelized french toast and marshmellow cubes are as sinfully delicious as ever. After City Bakery, we fought the jet lag and the cold to walk from across the avenues to Chelsea Market, which is at West 16th and 9th Ave. I had thought that this would be an outdoor, Christmassy market but when we reached there, I discovered it is an indoor market, a literal warren of stores designed by someone who must be a fan of the Ninja Turtles. There were snowflakes hanging from the pipe-ful ceiling made out of plastic forks and giant fans made even more giant by metal-rimmed cages. Still, it is worth a trip to check out some of the stores- Eleni's for stylish iced cookies and yummy cupcakes- their red velvet is very light and good and their icing is made of a blend of marshmellow and buttercream. Also, Ronnybrook Creamery for the richest chocolate milk I've had in awhile and really, anything dairy. Fat Witch Brownies for a huge selection of brownie flavours and Amy's Bread to watch bakers plait challah and punch chocolate chip-encrusted dough through the glass-fronted workshop. While you are in the neighbourhood, go check out High Line, which is a train track converted public park, running along or rather, above 10th avenue and Chelsea. After an overdue nap, we woke up at 2.30pm, which is when I discovered that most New York restaurants have a very definite lunch and dinner seating. We decided to hightail it to Sobaya in the East Village, which is on the same street as Ippudo ramen and many other hole-in-the-wall Japanese joints. We shared a cold soba and a hot udon set, each priced at $18 and complete with sushi bowls, soup and side dishes, a really good value meal, which explains it's popularity amongst professionals and students. After that meal, we really didn't need any dinner but we walked around all the shops and vintage furniture joints in Chelsea and the Meatpacking area and built up an appetite. Unfortunately, not many places were open on Sunday and we were dazed and confused by the time change, so we opted for an easy, nearby option, Basta Pasta, a Japanese Italian joint which specialises in light home-made pasta with Japanese-influenced ingredients like shiso, miso and uni. We had a uni pasta with pink sauce and a seared Chilean sea bass in clear vegetable and mushroom broth, the portion sizes were sensible, the flavours very clean, a very suitable dinner on a night when you don't feel like eating too much. After dinner, we decided to be adventurous and went to Veniero's, a venerable East Village institution for New York cheesecake. The shop has been opened since 1894 and sports old-world decor- marble flooring, wood paneled walls with large antique mirrors and Tiffany stained glass lights. A line forms out of the door on weekends for a bite of their light but creamy cheesy cake topped with glassy strawberries, many college years ago, this was a revelation to me in how cheesecake could taste. The taste is very straight forward and simple, in this city that is full of complex foods and techniques adn it's still the best. The other Italian pastries like cannolli and Sicilian cheesecake are also very good but not the star. Scampering back home in the cold, with cheesecake melting down our throats, it had been a happy day back in New York. I have managed to fall in love with a lens, even though I don't have a camera with me! 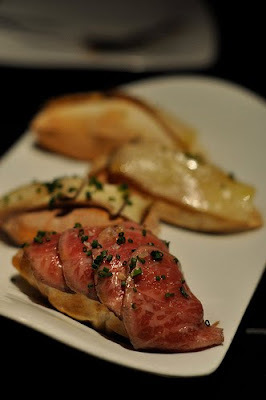 These are the gorgeous photos from our meal with M. at Bazaar at the SLS Hotel in West Beverly Hills. It was a wonderful treat from a wonderful friend and everything about the dinner was so special. What I read about Bazaar is that it cost more than $12 million to build and grossed more than $13 million in its first year and that it attracts celebs like Natalie Portman and Selma Hayek. I would imagine most of that money went into the kitchen and the army of chefs in the kitchen, although the bordello style dancefloor dining room and spanking white bathroom with reflective surfaces and a throne-like white leather studded armchair might have cost a little more than it looks. The restaurant serves no appetizers or entrees, all meals are made up of tapas, and signature items include drinks and canapés dipped in vats of liquid nitrogen. The menu is Spanish, divided into dishes that are traditional and "modern"—the unusual creations of Mr. Jose Andrés, who in his youth cooked at surprise, surprise, Spain's El Bulli. The style of 'small plates' is something that is picking up popularity or faddishness, depending on how you see it. This prelude might sound hokey but this meal immediately shot to the top of our LA list, no mean feat given that we were already very happy campers after the JAR and Daikokuya experiences. Although there were some elements of molecular gastronomy involved, it was done with a very light hand and the cooking was wholesome, creative and very tasty. We were four people, two omnivores, one pescetarian and one vegetarian, so we managed to try a real spread of their tapas dishes. You can find the full menu on Zagat by searching the restaurant name, as well as the per-dish price (which was about $7-12 per plate), suffice to say that we did not try even a quarter of the many interesting dishes, so I am looking forward to a brand-new meal there in the future! I'm not sure if there was a particular order to the way that we received the tapas, in fact it probably adds to the diversity to mix up the cold and hot, modern and traditional tapas. 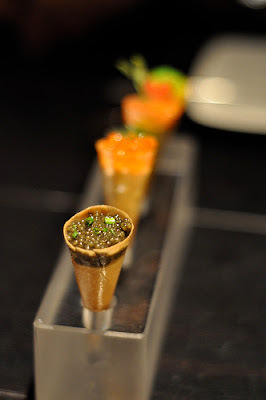 The cover photo is of the caviar cones, the one in focus is the American Caviar Cone, then the Bagel and Lox Cone, the Californian Cone (guacamole with tomato hearts) and the West Hollywood Cone (with rainbow tobiko). 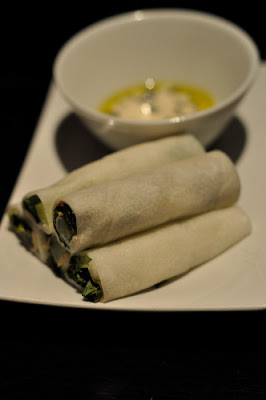 These were light and airy and the tranluscent thin spring-roll-like skin was a great counterpart to the sweetness of the cream cheese and the saltiness of the caviar. Visually, this was just a great little treat. 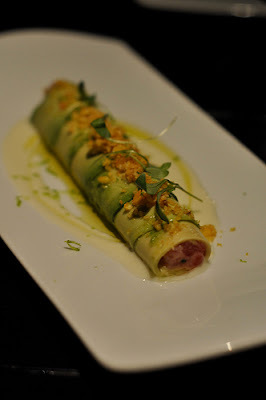 The first plate to arrive was the tuna cerviche and avocado roll, with jicama, micro cilantro, coconut dressing. While the execution of the avocado roll was charming, it was the addition of coconut, cilantro and jicama to the dish that really amped up the flavours and succulent quality of the cerviche. This went really quickly- four bites! 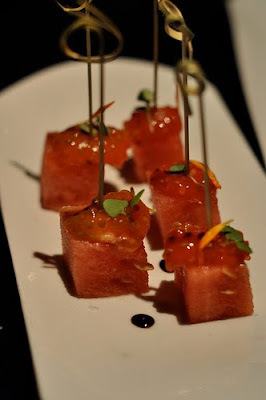 The second plate was the watermelon skewers with the tomato hearts. This plate also had great flavour but I was a little less impressed because I surmised that tomato hearts basically means tomato pulp and seeds, which were extracted from the rest of the tomato that probably went into their gazpachos and cocktail drinks. This is definitely something that we can easily do at home for appetizers though and a really good combination. The third plate was the wild mushroom soup. What I loved about this dish was the presentation. The waitstaff (all very knowledgable, discreet and smiley) plopped an egg yolk, a stack of shaved Idiazábalcheese, minced herbs and I think some sauteed onion on the plate and then poured a steaming mushroom consomme over them, from a sauce jug. We were then instructed to whisk the soup together and boy, you could taste the addition of the cheese and egg yolk alright. Rich, sweet and savoury, the whole bowl of soup was demolished and praised. 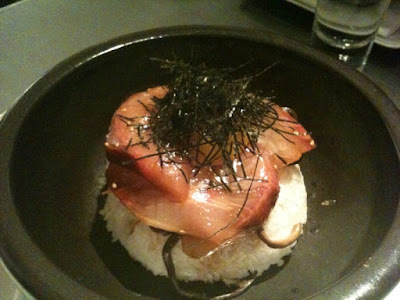 The fourth plate was one that I picked because of its ingredient, sea urchin. 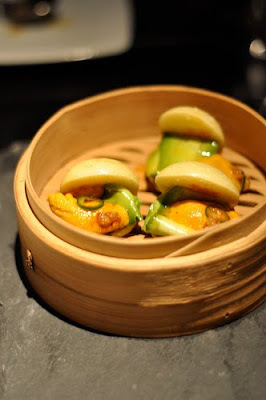 The sea urchin pieces came nestled in steamed buns, almost reminscent of chinese dim sum and were accompanied by slices of avocado. It seemed really easy to make but sea urchin is becoming such a common addition that the combination of the richness of the urchin and avocado and the bland sweetness of the bun was quite simple, yet unexpected. 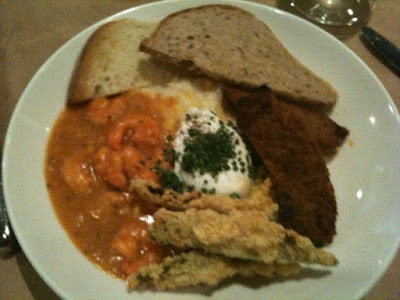 The fifth plate was also me making up for a disappointing cheese plate at Mozza the night before. 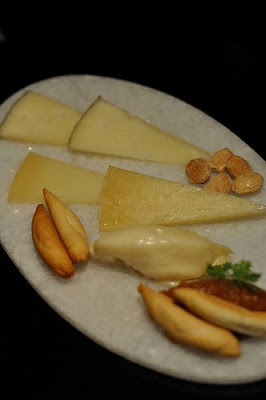 This cheese plate was the Manchego 'Pasamontes', Murcia al Vino and the Idiazabal cheese which appears often throughout the menu. The next plate, jicama rolls with mint, basil, pickled ginger, cucumbers and coconut dressing was probably the best. The jicama exterior was shaved thin, rather like the japanese restaurants do but the application and flavours were very different. The total taste was very balanced, yet light and juicy and somehow you just got the feeling that it was healthy and good for you- this is the one dish that I would have loved to learn the proportions for. 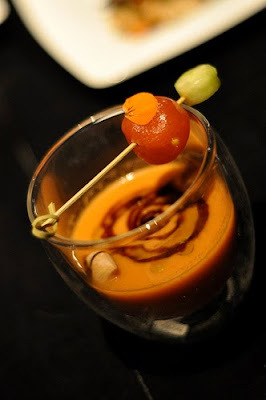 The seventh plate was actually another soup, this time a cold tomato gazpacho, with a pretty garnished, a peeled cherry tomato skewered with a flower petal. The gazpacho was unlike the deeper lobster and tomato bisque that we had at JAR, this was chilly, yet deep, nuanced and spicy, probably with the addition of the dark sauce, perhaps caramelized, reduced balsamic vinegar? I guess if I were to make it, I would mix the vinegar with a smidgeon of fish sauce, just to confuse. 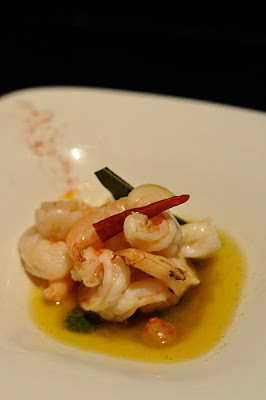 The eighth dish was sauteed shrimps with garlic ajillo and guindilla pepper, this was tasty but less interesting to me, very much like a chinese stir-fry, just with different flavours from the olive oil and peppers. The following dish was the one that some of the others thought was the most creative and unexpected. 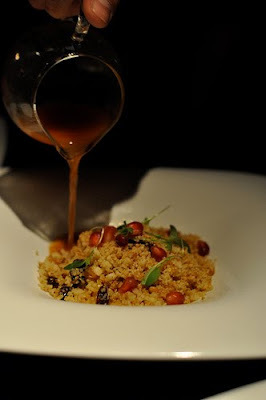 This was a cous cous made from cauliflower puree, harissa, lemon, fried quinoa. It looked like a fairly ordinary cous cous, studded with pomegranate seeds but the cauliflower puree had really been infused into the rice and it was delicious! 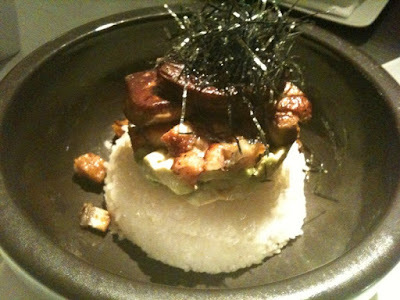 Again, it would be interesting to know more about how this dish was conceived and cooked. 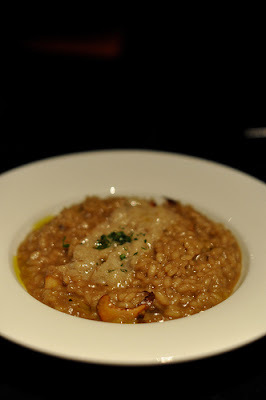 The plate that followed on was a little similar, a risotto of wild mushroom with cheese. What made this plate was the beautiful consistency of the rice, the thick, chewy, pungent mushrooms and the wonderful creaminess of the dish, it was one of the best risottos I've had and it's amazing that the kitchen can sustain that kind of quality over small plates and quantities of risotto. We had come to the part of the menu chosen, clearly, by the omnivores. 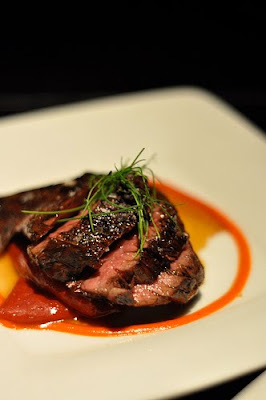 This was the Hanger Steak with piquillo pepper confit accompaniment and dill, grilled and crispy on the outside and soft and juicy on the inside. 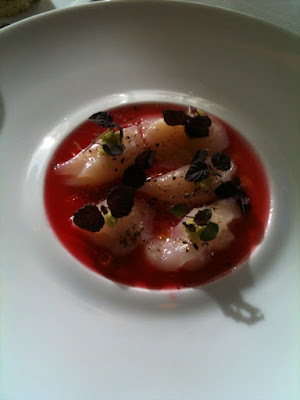 After the vegetarian and pescetarian dishes, it was almost shocking to see the bright waves of red on the plate. The steak was about the size of my palm and cut into luxuriously thick slices, my fellow omnivore cheered when he saw it arrive. The strange thing about the meal is that often, you imagine that small plates don't really fill out up but this was like eating a good dim sum meal, the speed of the food was just right and we left feeling, actually, really sated. The next plate was the cleverly named ‘Philly cheesesteak’, consisting of air bread filled with cheese and topped with Kobe beef. There was also Hilly cheesesteak, which was airbread topped with melty cheese. I chose the latter which I think was the wrong choice, although both were beautifully executed. 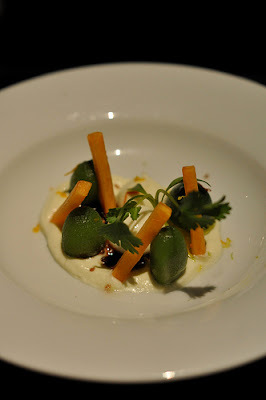 The fourteenth and last plate was not a dessert but it almost functioned like one for us, it was Japanese baby peaches and persimmons with yogurt and olive oil. I didn't really taste the peaches, these tasted more like sugared kumquats and kiwi but they were really sweet and contrasted well with the yoghurt. It was a great way to round off the heaviness of the beef and cheese. The only thing that I would say about Bazaar which was a little wanting is that although the service is great, the dramatic lighting, hotel lobby location and lack of a chef leave it feeling a little impersonal but perhaps it is better that the food is the focus. Do yourself a favour, even if the photos don't have you already drooling, take it on my word and book this place (I hear it is not that easy to get prime reservations) if you are in LA, it is the kind of place of happy eating, one of those meals that effortlessly dispenses all thought of diet. We are in LA for a wedding and New Years and have been eating well, though there are no pictures, since Colin is not around and I don't really like taking food pictures on vacation. I was really looking to get inspired though, given the recent openings in Singapore haven't been much to talk about and I had reached a point of being quite tired, of food. Shortly after landing, we started the drive to Big Bear Lake, east of LA for a couple days of skiing. What started as a 2 hour mapped route became 4 hours in the traffic and by the time we reached there, we were hungry for a good meal. The Gold Mountain Manor bed and breakfast cheerfully sent us to Madlons, a small restaurant helmed by a sister and brother duo, tucked into the mountain higways. Chelsie and Robert Orr graduated from Cordon Bleu school in Minneapolis and Pasedena, having left their previous lines of work in business and accounting. The food was best described as modern Californian, the amuse bouche was actually the most interesting, a slice of creamy goat's cheese on a lightly salted cracker, topped with honey and a raspberry. The combination of sweet, salty and savoury was complex, yet the construction of the dish was so very simple. A good combination to try at home, a fresh raspberry on strong cheese and drizzled with some truffle honey. Maybe even with a sprinkling of dill. The salad was figs, goat's cheese, mixed leaves and raspberries again, with a balsamic vinegrette and caramelized walnuts, light and refreshing. We shared a seafood pasta, Shrimp, Clams and Lobster in a White Wine and Lemon Sauce and I eyed the duck on the menu but unfortunately was just too tired to continue. Dessert was a creme brulee, awful American-style, thick custard set in a deep ramekin (no, no, no!). Dinner was $65 for two, largely shared dishes of two appetizers, one pasta and one dessert, not particularly cheap. The amazing thing about Madlons is that it is set, literally, in the middle of nowhere. I'm not sure that perhaps this doesn't work to their advantage, given the captive audience of overweight Orange Country second-marriage mid-lifers who escape to the mountains to hike and find their mojo, maybe they really are the best joint in the county but I was nonetheless impressed by this family, who obviously tend their little restaurant-house with pride and charm. After two days of bad American food, like diner spaghetti and In-and-Out burgers, I was pleased to get back to downtown LA where we went to dinner at Mi Piace, in the gentrified Old Town Pasedena. All the restaurants in LA have mood, they are all generally moody with dim lighting and polished furniture (and yes, beautiful people but not as many as I would have thought) and also serve as lounges. That's right, lounges, I guess that's what every restaurant wants to be known as- it's a bit like Prive in Singapore but with all-Mexican staffers. Mi Piace is one of the more commercial, popular restaurants in Old Town, right next to the two storey, glass-fronted Pottery Barn. The food was gratitously warm, comforting and stylish, we had a bruschetta starter, a generous number of crostini bread with sweet, tart tomatoes. There is nothing worse then bruschetta with grainy, Asian tomatoes as some of the Italian restaurants try to gyp with you back home, these were infused with basil and juicy. The pastas were a saffron risotto with a pound of Maine lobster and a home-made egg fettucine with bolognese ragu. Although there wasn't a pound of lobster on the dish, the risotto had perfect consistency and the fettucine was fragrant and bouncy-sweet. The good, knowledgable service and the trendy surroundings, a mute green wall, tall red bauble christmas trees fashioned from bare branches and screens of mirrors, helped lull us into a complacent appreciation for the convival food and atmosphere. The letdown was dessert, the famed espresso bread and butter pudding turned up like a slice of banana bread and the lemon raspberry tart had stiff lemon mix with a rock-hard crust. The desserts clearly look better than they taste and are probably bought in but other than that, this was a welcoming, hearty meal and the plate prices were actually cheaper than Madlons. In fact, the generous pastas dishes were $18, which led me to wonder how they sustained such a sizeable restaurant on $18, while in Singapore, we have to pay $28 for a similar ambience and finishings and really second-rate pasta, at times! LA was a windwhirl of the LA farmers market, Rodeo Drive and the Getty Musuem at sunset. The wedding was sited at the iconic and historical Langham Huntington courtyard in Pasedena, where Michelin Star-winning Top Chef winner Michael Voltaggio has his kitchen. On the night before the wedding, a group of us adjourned to JAR, a modern chophouse in the heart of Los Angeles, helmed by another chef from Top Chef (see what American network television does to you) Suzanne Tracht. This restaurant had an entrance blocked off from the deserted, seedy street outside it, by a solid wood oak door. Once inside, it was like falling down the rabbit hole. The restaurant was large and stylish, a cigar bar in front led through to a low-ceilinged plush corporate-style dining room studded with black UFO lights and beautiful upholstered leather chairs. The lighting nonetheless, was so dark that no photos would really have done the food justice. The menu was promising, it was short, presented on a single page and had small sections of "Braises", "Broilers and Roasts". The side dishes of garlicky parsley fries and creamed spinach sounded well-proportioned and divine and indeed, they were. The fries were in fact, so well coated and fried, that they tasted like they still had their skins on, a bit like curly fries, if you know what I mean. The service was impeccable, the sourdough bread, a crispy hunk sliced neatly and served with excellent butter, even more so. I considered the rib eye before being convinced into their specialty, the pot roast with caramalized onions and horseradish. Within our party, we had two appetizers, the tempura squash flowers (courgettes) which were stuffed with meat and a little overfried but still delicious and a lobster bisque, laced with the tanginess of tomatoes, spiciness of capsicums and sweet creaminess of sour cream which had us all cleaning the soup plate. We also ordered the sea bass and the braised lamb shank which was gigantic- I've made veal shanks smaller than that! The pot roast and I think even the lamb shank were quite a revelation. Crispy and striated on the outside, the meat was soft and falling apart on the inside. The juicy fullness of the meat contrasted with the sharp lightness of the horseradish, which had been blended into a cream, almost an etheral ice-cream. Served with some vegetables and the braising liquid, the square of short-rib was so large that I could not finish it but regretfully had to push away the last corners of the meat. The desserts were the only slightly disappointing part of the meal, we only had space for one dessert between the four of us and the apple bread and butter pudding came out like an exploded cupcake, still with the ridges of the cupcake paper they must have baked it in. By then though, the impression was already set and we barrelled out of there, impressed, full and determined to serve the next roast I make (made from shortribs) with horseradish ice-cream sauce. A meal for two would come up to $94, without wine, which suddenly made Madlons look very poor value! How do they serve such large portions of braised short-ribs for $29? Dollar for dollar, that is a great-value meal into which had gone a lot of effort, timing and consistency, something you can't really find for that price in upscale Singaporean restaurants. JAR has been the winner of numerous Diner Choice awards and I would definitely make a reservation here if you are headed to LA. After the wedding, we moved into downtown LA, right next to Little Tokyo. I had made a reservation at Josie's in Santa Monica but the traffic and our full bellies made it difficult to contemplate getting there by their early closing time of 8pm. Instead, we spotted a huge line at the ramen shop opposite the hotel and our Asianess won out. There is nothing like a line and a good ramen deal to get Asians excited. To their credit, Daikokuya Ramen did have non-Asians in it but on the other hand, it also means Little Black House and had really good Too Fast Too Furious type customer-watching. (Yes, that's me, I look at other tables when I eat, so do we all). It was exactly like stepping into a hole-in-the-wall ramen shop in Tokyo. The heat, oil, pork bones and chives hit you like a wave and there's no point putting any pictures up, just imagine a dive ramen bar of particularly good quality and authenticity and there you'll have it. There was a huge red lanturn hanging in the window and even large steel pots of steaming broth behind the bar, with furious tossing, chopping and frying producing great sets of ramen plus one other dish of your choice, ikura don, fried rice, unagi don and other reasons to be glad you didn't drive needlessly out for hours on a crowded, stuck highway. In reality, the ikura was not that fresh and the fried rice was not as fragrant as say, Sushi Yoshida's garlic fried rice and I saw the chef pinch something that looked suspiciously like white MSG powder but the sets are so mispriced ($18 for all the dishes as opposed to $12 each for a ramen and rice dish), that this place is packed for hours and has numerous locations that all stay open past midnight. We put our names on the list, walked around the very dodgy Little Tokyo for 45 minutes, bought green tea mochi and royal milk tea and slurped up the rich broth and springy noodles. The pork was very fatty, like streaky bacon, but the overall taste was excellent, it had the broth of Tampopo ramen with the noodles of Marutama. We then weren't that full on New Year's Day, which was a good thing because we went to the LA Farmers Market for lunch and had crepe and black-bean tortillas. Note to anyone interested, the LA Farmers Market is not a farmers market, it is merely a covered market though yes, it has locally grown produced and slaughtered chickens and things like that. Many cute coffee shops and crudely-made pastries. Anyway, that night, we geared up for a 10.15pm dinner at Osteria Mozza, which is the Mario Batali restaurant where we would spend New Years. I had heard much about Osteria Mozza and was looking forward to it and their Mozerella cheese bar but I wasn't expecting a super-crowded, low ceilinged, baby-blue walled eatery. Straight off, it seemed off-kilter, the waitstaff kept pushing the drinks, sparking wine to celebrate New Year's, are you having some champagne? They also refused to seat us in a complete table of 8, then came round to tell us twice that they were making an special exception since it was New Years, before stuffing us in a round table for 5 and proceeding to sell away the two rectangular tables of 4 each. Next to us, was, surprise, a table of 9. Undaunted, we ordered off the antipasti and cheese selection, a Burrata with leeks and a Scamorza panino with Armandino’s mole salame & pickled cherry peppers. At $16-$18 a plate, you would think that these would be large bags of creamy burrata but it was more like a little fondant cake of burrata and a smear of scamorza. We had ordered these with the Grilled Octopus with potatoes, celery & lemon and the Testa with green olives & oregano, thinking we would share but it amounted to a laughably small and unfulfilling portion at $16 apiece. The waitstaff pushed recommendations, like the Testa, told us that half the pastas were unavailable and that he didn't think we had enough food. We wound up sharing three pastas, the Gnocchi with Duck Ragu, Goat Cheese Ravioli with five lilies, the Linguine with clams, pancetta & spicy Fresno chiles and the Grilled Quail wrapped in pancetta with sage & honey ($34) between four people. The dishes were not bad and in retrospect, not as expensive as the appetizers but they were not memorable either, the gnocchi was a little too doughy, the linguine was not made in-house and overwhelmingly spicy and the quail, which some websites promised would be life-changing, was rather dry, though it improved in the center with the meat stuffing. For dessert, we had a pretty sad, thin cheese plate and a chocolate cake, or tart really, rich with a small square of honeycomb and nougat. I usually don't look forward to dessert at Italian restaurants, finding them often more rough and limited than French or modern American restaurants but here, where 5 of the 7 desserts were gelato and the other was pine nuts and honey, we really did find ourselves short of choice. 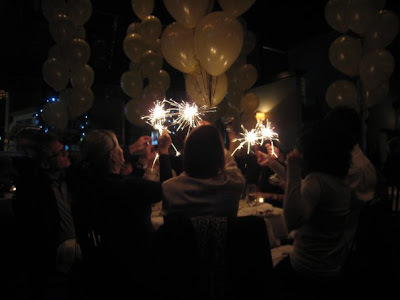 This was not our favourite experience or destination but it was fitting for the occasion, the restaurant did provide strings of helium balloons and ribboned bells to ring in the New Year!